Ok so right up front when I came across this title on McCreight's publishing co. web site I was intrigued by it. Knowing his attention to detail both in covering the subject matter and in his illustrations and photo's. Knowing also his preference for KISS Keep It Simple Stupid type of working to achieve an end. 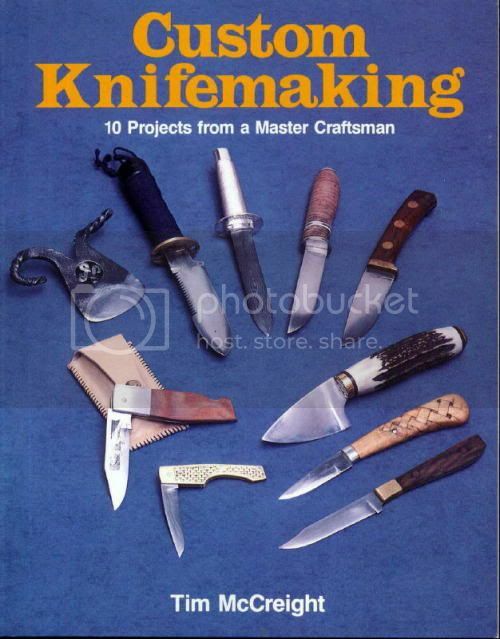 I thought that this would be a great book for the one of or even the occasional knifemaker. Since there are 10 complete projects from start to finish. Including the sheath work, to complete a knife. It probably be a great one to own and review for others that just think they might want to some time in the future. After the usual niceties, a safety warning (which in it self is different) a short introduction/history of knifes. He starts off with his usual completeness on the simple tools needed to make a knife. Cutting tools,Shaping tools,Drilling tools,Finishing tools,Abrasive Papers,Hammers,Torches, Miscellaneous Tools and the Workshop. He covers a wide assortment of tools and their use, and what you need along with a sturdy simple wood bench. A Brief History, Structure of steel;properties of Tool Steel, Hardening and Tempering. Descriptions of Popular Steels, Other Knifemaking Materials; Brass. Nomenclature, Blade Cross-Section, Knife Format, Care and Maintenance, Sharpening. Materials,A Molded Pouch Sheath, A Snap Sheath, A Molded Pocket Sheath. The Fire, Fuel,Tools, Using the Forge, The Goal of Forging. This is probably the chapter with some ideas, that I consider the best. His forge (Coal Forge) is an award winner for simple , cheap and fast built up and use. It is a wheel rim forge, not a brake drum. Now granted his costs for materials is out dated. the the idea of setting it on a stacking of 3 sets of blocks that you can adjust the height. Lining it with broken brick and other than putting a layer of fireplace motor in the buckets over the top for a fire clay floor. along with a simple air/hair dryer. It is a perfect solution for either a one time deal or an occasional forge that will spend most of it's life under a bench. The other great thing about the forge chapter it covers the solid fuel types and use better than a lot of books sold as a blacksmithing hand book etc. Now the reason I have listed the material covered separately for the Damascus blade is having no first hand experience and only the rereading the information for years. This way I will hopefully stop any questions on that process covered in the book by the more knowledgeable. It has been a very enjoyable book to read. And he does a very good job of explaining knifemaking, simple tools, and book with simple process and the making of some very high end knifes simply! The chapters that have not been expanded on, are pretty much self explanatory.